I just wanted to pay for my cappuccino. But when I stood up from my seat and began walking to the cashier, a waitress stood in my path and stopped my trajectory. She pointed to a pregnant woman with a milkshake staring intently at me from the corner of the café. Across from her was a man, presumably her husband, who switched his surveillance between my confused expression and the gaze of his spouse. Acknowledging the awkwardness of the moment and the communication difficulties that undoubtedly were to come, we grinned. The pregnant woman, despite having cheeks scarred by acne, was a beautiful woman of medium-brown skin. “Chocolate,” the Indonesians might call her. Seemingly happy to have secured my attention, the woman raised her palm in greeting and proceeded to make two motions with her right hand: one was a wave, inviting me to come closer to her seat; the other was a soft rub atop her pregnant belly. I raised my eyebrows and, quite beside myself, stepped a bit closer. From the pregnant woman’s mouth came a string of Indonesian words I had never heard together in sequence. I understood something about a hand and a stomach. Somewhere was the word “give,” and then a “please.” Still at a loss for the meaning of the woman’s request, I stood still. The pregnant woman, now bashful, smiled and turned away. I looked questioningly at the waitress in hope that she might provide a more comprehensive explanation. I laughed, but internally my mood plummeted. How was I to respond to an honor — I knew — I only earned due to the color of my skin? I knew that, like in many other third world countries, light-colored skin in Indonesia was highly prized above the native brown. So what was beauty, then? Was it pigment alone? Did the woman notice that I had features on my white face, and that these smaller details established the real grounds for physical assessment? Although I had attracted attention many times due to my white skin, I had never felt less unique than in this intimate moment, when I was expected to bestow a blanketing gene of “whiteness” on an unborn child. I recalled all I knew about white imperialism, all the repulsive images of my pasty skin in the tropical sun, and I felt decidedly ashamed. In the time it took for my white guilt to settle in, the pregnant woman stood up from her seat and arrived at where I stood. Her shyness was gone. American Alternative music played from the stereos. All around, Muslim teenagers in school uniforms stuffed their gossip-mouths with chocolate cake. My hand was up. The pregnant woman had taken it. And then there it was, guided by her hand on my wrist, rubbing a stomach that was tight and round enough to burst. At once I felt concern for the future of this baby. Suddenly (again, quite beside myself) I felt the ugly churning of potential motherhood. So despite what I often call my “spiritual detachment” from the Godly realm, I prayed that the baby in this woman’s belly would grow to be proud of the color of its skin. After several seconds of rubbing, the woman let go of my hand. She looked at me with an expression of gratitude and relief. I smiled, hoping I had truly done something good. 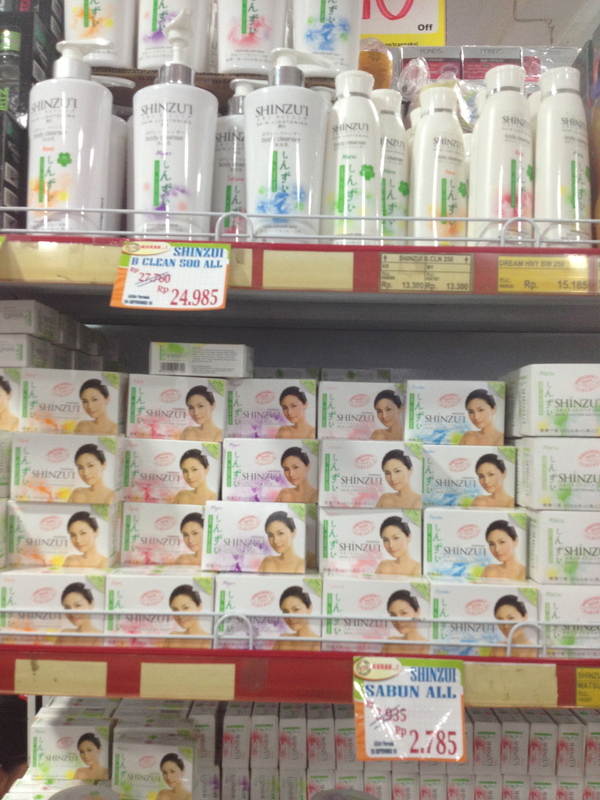 This is a shelf-sized display of skin whitening products at the college supermarket. The selection of whitening soaps and creams continues along another wall-sized shelf. Finding healthy soaps in Indonesia can be a significant challenge for women, since almost all Indonesian skin products contain lightening chemicals. God — what a story — to the uninformed (me) I initially had no idea where you were going with this — . What a situation — just filled with potential, positive and negative. What a great post. I am shocked at the story but so proud of your reaction. To be fair, you are extraordinarily beautiful for other reasons than just being white. Hello, I’m currently an high school exchange student from America in Yogyakarta. I find this happening to me too, person after person telling me I’m so beautiful and men on the street shouting out that they love me. But I feel the only thing they see when they look at me is my white skin and their stereotypes. It can be so frustrating sometimes. But it’s nice to know someone else is experiencing the same thing.